Located 67 nautical miles north west of Kawthaung and 12 miles north of South Twin Island, North Twin Island is a tree covered granite island which has underwater topography similar to many Similan Islands dive sites. This is a dive site to see various shark species including white tip reef shark, leopard shark, grey reef shark, nurse shark and occasionally even a bull shark. Manta rays and eagle rays also visit North Twin from time to time to use the cleaning station services here. Visibility is generally excellent averaging 20m but often more. To the south west of the island starting at 5m below the surface, North Twin Pinnacle drops to 35m. Large boulders are covered with purple soft coral and encrusting sponges. Long spiny sea urchins and a few anemones cling to the rocks as do gorgonian sea fans, sea whips and feather stars. Seahorses and ornate ghost pipefish can be found in the sea fans. Emperor angelfish, bicolour parrotfish, grouper and wrasse swim around the rocks. Solitary clown trigger fish can be seen as can titan trigger fish and harlequin sweetlips. Moorish idols and the similar looking schooling bannerfish are also present. Lionfish and bearded scorpionfish are abundant. In shallower areas octopus and cuttlefish are common as are fimbriated and white-eyed moray eels. North Twin Plateau is a separate dive site one kilometre to the north west of North Twin Island. Here a series of granite boulders descend down from 15m past 40m. The dive site is spread out, deep and subject to currents so is not really a beginners dive site. 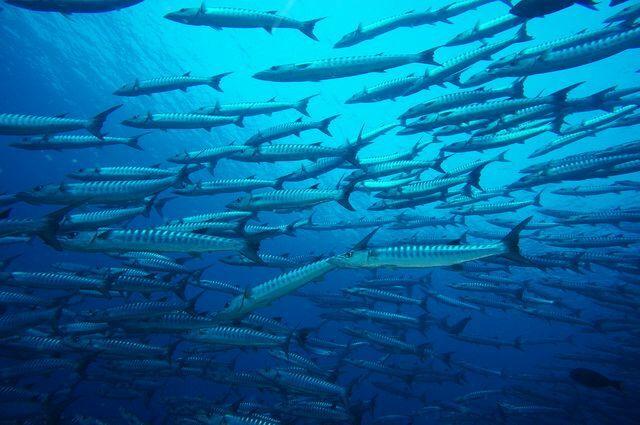 It attracts lots of pelagic fish such as rainbow runners, trevally and blue fin tuna as well as reef sharks in the deeper areas. Tiera batfish are often cruising around in open water as are giant barracuda.